English apples have individual flavours and taste depending on the variety. 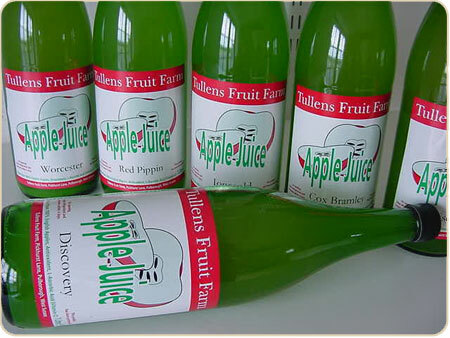 We therefore press several of our most flavourful and prolific apples to create varieties of apple juice. Unlike the brown characterless juice available in supermarkets or mass produced by large Corporations our Cloudy juice has no added sugar. It is simply pasteurised to ensure longer life and has vitamin C added to maintain its original colour. Cox/Bramley - We add around one third Bramley apples with our wonderful Cox varieties to produce a juice with a "bit of a bite". Probably our most popular juice. Worcester - Our sweetest juice. Worcester Pearmain apples picked at their sweetest and pressed while they are crisp produces a delightful juice much loved by children. Discovery - The pink flesh of these apples gives the juice an unusual pink tint. This carries through into the juice which has a medium sweet just picked early English apple flavour. Jonagold - Perhaps the juiciest apples we grow produce a sweet apple juice . Again very popular with our younger customers. Red Pippin- While these are also sweet and juicy apples we pick them a little green to produce a sharper juice. We also press other varieties from time to time dependant on the abundance of that variety of apple in that season. For example Cox Orange Pippin and a Worcester /Bramley blend will be pressed in 2015. All varieties are sold in 1 litre bottle . We also sell Cox/Bramley, Discovery and Worcester in 330ml bottles for our restaurant and pub customers.